If you have multiple AWS Site-to-Site VPN connections, you can provide secure communication between sites using the AWS VPN CloudHub. This enables your remote sites to communicate with each other, and not just with the VPC. The VPN CloudHub operates on a simple hub-and-spoke model that you can use with or without a VPC. This design is suitable for customers with multiple branch offices and existing internet connections who'd like to implement a convenient, potentially low-cost hub-and-spoke model for primary or backup connectivity between these remote offices. The following diagram shows the VPN CloudHub architecture, with blue dashed lines indicating network traffic between remote sites being routed over their Site-to-Site VPN connections. 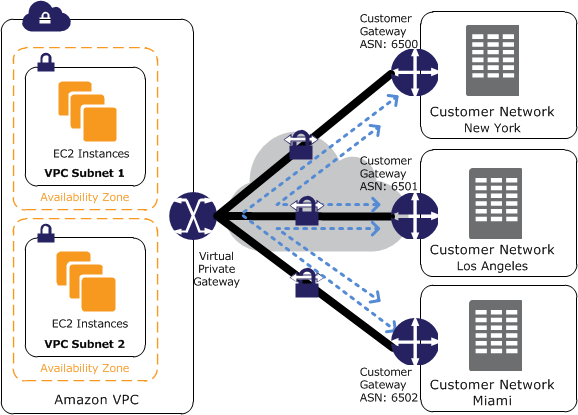 To use the AWS VPN CloudHub, you must create a virtual private gateway with multiple customer gateways. You must use a unique Border Gateway Protocol (BGP) Autonomous System Number (ASN) for each customer gateway. Customer gateways advertise the appropriate routes (BGP prefixes) over their Site-to-Site VPN connections. These routing advertisements are received and re-advertised to each BGP peer, enabling each site to send data to and receive data from the other sites. The sites must not have overlapping IP ranges. Each site can also send and receive data from the VPC as if they were using a standard Site-to-Site VPN connection. Sites that use AWS Direct Connect connections to the virtual private gateway can also be part of the AWS VPN CloudHub. For example, your corporate headquarters in New York can have an AWS Direct Connect connection to the VPC and your branch offices can use Site-to-Site VPN connections to the VPC. The branch offices in Los Angeles and Miami can send and receive data with each other and with your corporate headquarters, all using the AWS VPN CloudHub. To configure the AWS VPN CloudHub, you use the AWS Management Console to create multiple customer gateways, each with the public IP address of the gateway and the ASN. Next, you create a Site-to-Site VPN connection from each customer gateway to a common virtual private gateway. Each Site-to-Site VPN connection must advertise its specific BGP routes. This is done using the network statements in the VPN configuration files for the Site-to-Site VPN connection. The network statements differ slightly depending on the type of router you use. When using an AWS VPN CloudHub, you pay typical Amazon VPC Site-to-Site VPN connection rates. You are billed the connection rate for each hour that each VPN is connected to the virtual private gateway. When you send data from one site to another using the AWS VPN CloudHub, there is no cost to send data from your site to the virtual private gateway. You only pay standard AWS data transfer rates for data that is relayed from the virtual private gateway to your endpoint. For example, if you have a site in Los Angeles and a second site in New York and both sites have a Site-to-Site VPN connection to the virtual private gateway, you pay $.05 per hour for each Site-to-Site VPN connection (for a total of $.10 per hour). You also pay the standard AWS data transfer rates for all data that you send from Los Angeles to New York (and vice versa) that traverses each Site-to-Site VPN connection; network traffic sent over the Site-to-Site VPN connection to the virtual private gateway is free but network traffic sent over the Site-to-Site VPN connection from the virtual private gateway to the endpoint is billed at the standard AWS data transfer rate. For more information, see Site-to-Site VPN Connection Pricing.